Apple season is at its peak in September and early October, making apples a very popular theme for the beginning of the preschool year. Luckily for teachers, there is no shortage of apple related activities to choose from when planning a thematic unit focusing on the fruit. Early in the preschool year, math activities should focus on patterns, graphing, simple counting and one to one correspondence. Presenting students with something familiar to work with will often help reinforce the basic foundations of preschool math. Apples are certainly a familiar fruit to most preschoolers and can be included in almost all preschool math lessons. Try some of these activities when planning for lessons for preschool math. Apples used in activities can later be peeled and used in a cooking activity to make applesauce or individual apple pies. Graphing: Create a poster showing two columns, each with a different colored apple at the top. As a sign in activity, have children taste two different slices of apple. Try using red delicious apples and granny smith apples as these tastes are very different. After tasting each slice, children can vote for their favorite flavor by either writing their name or placing a sticker in the right column. Bring the results of the sign in activity to your morning circle time. Discuss the results with children and count the results of the voting together. Create a bar graph using the results, allowing children to color in the correct number of spaces in each bar. Patterns: Choose three very different looking apples to create patterns with. 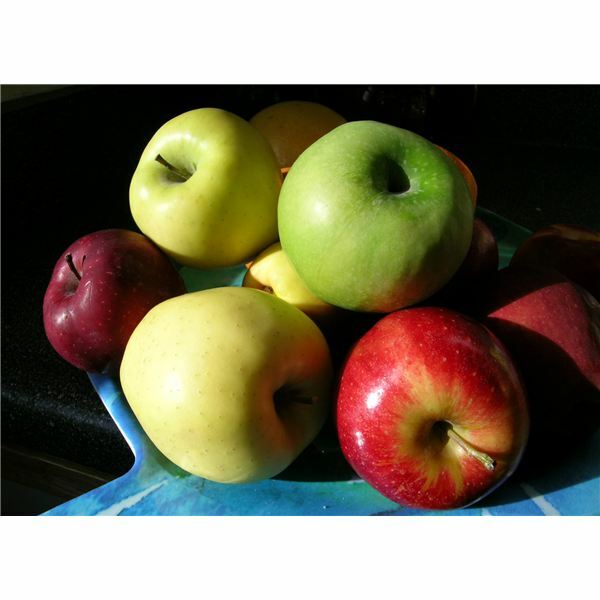 Three good choices are gala apples, granny smith apples and golden delicious apples. Create a pattern using the apples and ask children to finish the pattern using the leftover apples. Or allow the children to create their own patterns for classmates to finish. Begin with simple AB patterns and move on to more challenging activities as children master this. This activity can be done in worksheet form if you would rather not use real apples. Counting: As a counting activity, collect several different colors of apples in a large basket. Create two large dice using cardboard boxes covered in white butcher paper. On one die, color each side one of three colors: yellow, red, and green. Decorate the second die to resemble a real die with one to six dots on each side. As a large group activity, have one child roll both dice and then choose a friend to pick out the correct number and color of apples rolled. Allow each child to have a chance being the roller and the chooser. Money and Counting: Set up an apple store in your classroom. Place a few apples in several baskets in your dramatic play center. Give each child playing in the center a wallet or plastic sandwich bag with twenty pennies in it. Place signs in the apple baskets advertising the price of each kind of apple. To keep it developmentally appropriate, apple prices should be simple enough for children to be able to count and make change on their own. Hand each child a shopping list, which will consist of a drawing of a certain number of apples of a certain color. Have children shop for the correct number and color of apples and pay you with their pennies. With a bit of imagination, you can create engaging and challenging activities for preschool math. Apples are the perfect theme to begin the year and reinforce children's understanding of early math concepts.